-- Select a Size -- X-Small - Out of Stock! Small - Out of Stock! Medium Large - Out of Stock! 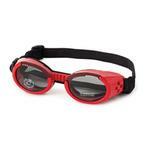 Doggles dog goggles are designed to protect dogs' eyes from the sun's harmful rays, flying debris, wind, rocks, or bugs. 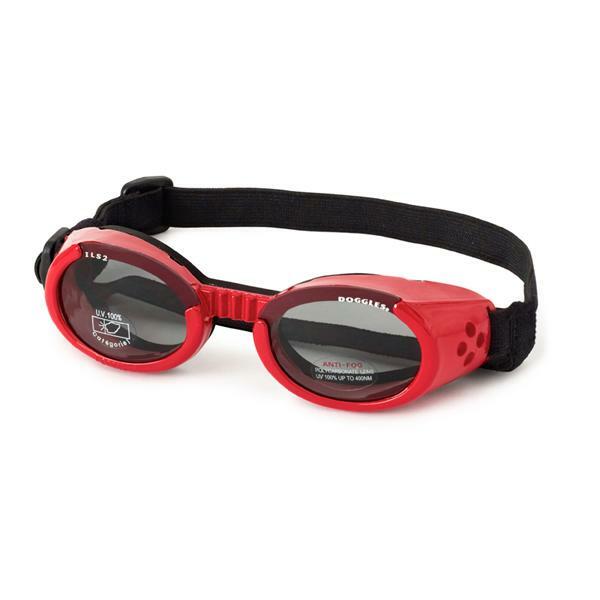 Your dog can't tell you his eyes hurt, so be proactive and protect your dog's eyes with these ILS Shiny Red Frame with Smoke Lens Doggles! Doggles also come recommended by Vet Ophthalmologists to protect their patients in all types of situations and also after some types of eye surgery. And don't forget that these Shiny Red Frame and Smoke Color Lens Doggles are in the height of dog fashion! Doggles - ILS2 Shiny Red Frame with Smoke Lens Customer Photos - Send us your photo! Slater is a pediatric cancer therapy dog. Visit kids in hospitals all over the country, bringing smiles to those who need them most. From Christmas this year. "My future's so bright, I gotta wear shades," says Dasher -- and only the Doggles-ILS2 Shiny Red Frame with Smoke Lens will do! Posted On 02/05/19 by Eastpointe from Eastpointe, MI Yes, Eastpointe recommends this product! I was worried that my chihuahua would fight me about wearing these but because of the foam cushion around the lens it wasn't too much of a fight. She got use to them rather quickly and she looks adorable while her eyes are protected.